OK, it's not about monograms, we've already done that . This time the challenge is to pick one letter and see how many things you can use on your card that begin with that letter. Now then, you can't choose "P" and just have pink paper, pink brads, pink ink, pink ribbon - oh no no no, that's not the way it works! Got the idea? We're hoping this one will be great fun as well as maybe making you think really hard, the Design Team have come up with some cards as a starting point - see if you can work out which letter they've all chosen before you seek enlightenment on their blogs! As always this is much more about what you Girlies come up with, so please come back when you've made your card and let us know where we can see what you've created, and of course your list of the things you used! Hi its Keryn here and it's my turn to set the dare this week. But before I do that thanks so much for the fabulous cards you've made for Jo's Frilly Dare and the Dots and Dashes little extra. We really enjoy looking at your cards. I know you've all got buttons stashed away somewhere, whether they've been purchased at a cardmaking store or you thriftily snipped them off DH's old shirt. I'd like you to find those buttons and use them somewhere on a card. They can be real buttons, craft shop buttons, die cut buttons, faux buttons or another type of button, surprise us all. We're very happy to have not only the usual NZ, Aussie and UK contingent this week, but also cards from Germany - from our latest, very talented Guest Designer, Rein, and from Sylvie who's kindly stayed on for another week and adds a French flavour to the blog. We are just LOVING seeing all your frillies! Keep them coming though, there's plenty of room on the links list for more of your pretties! Hi all *waves* It's my turn (Jo) to dare this week. Before I get on with the dare, all of the DCM'ers would like to send very warm wedding wishes to Rhi and Matt for their wedding day tomorrow :) We all hope that you have a fabulous time and that the sun shines for your special day. We wish you every happiness in your life together. Thank you so much once again to everyone who joined in with Tracie's Photo Dare and the Little Extra- you all produced some absolutely gorgeous cards ! We are so looking forward to seeing what you put together for this dare. You must make a card with a frill - it could be some lace, frilly ribbon, a hand cut or decorative scissor edge or a folded paper frill - or what ever you choose to make.... you decide! Is it just us, or is everything really hectic at the moment? It's great to see you are still finding time to have a go at our dares and we're really enjoying seeing all your "Photo Finish" cards - there have been some fantastic ideas for using photographs on cards already so "Thank You" for sharing them with us. It's Little Extra day today and this week we've another sketch for you to play with, we hope you'll have some fun with this one. Remember that you can twist it, stretch it or even shrink it -just as long as the basic sketch is still there to see you can get as creative as you like. The only rule is that you enjoy yourself - oh, and show us what you've made, of course! We're very happy to have the wonderfully talented Sylvie (crazystamps) joining us for a couple of weeks as our Guest Designer. If you're not already a fan of her work, please take a few minutes to check out her blog - you won't be sorry! Ooops! sorry folks, we're a Little Late posting the Little Extra today, but here you go. It's one of our recipes this time, all you need to do is include all the ingredients on your card - remember, you can always add more things if you want to. As usual we have cards from the DT to help you get your creative juices flowing, and don't forget, we love to see your work so share your cards with everyone by leaving a message with your link. It's Daring Cardmakers day again and we have a lovely new dare for you to play with - but first we'd like to say a great big Thank You to all who joined in with Jane's "Checked Out" Dare - the cards were fantastic as always and we really do appreciate the time and love you put into your cards for each and every challenge we set. We hope you enjoy the dares as much as we do. With so many lovely people playing along with us we can't all promise to leave a comment on every card anymore - there are soooo many to see nowadays - but we do make sure we visit the blog of everyone who makes a card and we'll leave as many messages as we can - we hope you understand. OK, Absolutely anything goes this week as long as it's on the theme of TIME. So you can use clocks, calendars, quotes, sayings, pictures, nursery rhymes, or altered art-type stuff, whatever takes your fancy - just take some time out to play and have some fun; remember, time flies when you're having fun! We'd love you to join in with this dare. 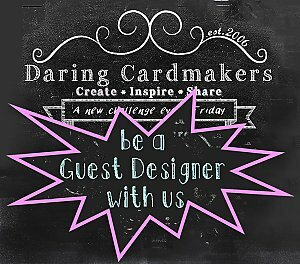 You can share your cards either by leaving a link to your blog or by emailing a photo to daringcardmakers@hotmail.co.uk for uploading to our gallery. - everyone is welcome to play.